Since our business is mostly about “Startups,” that is helping folks start up, grow, and scale their businesses, you can imagine that every one of those 365 days, in essence, amounts to a tug of war of high and lows, the small business headwinds pulling simultaneously in every direction. Lets start with the Shirley Chisholm hashtag movement we engineered. This was a great “high” not only for our company but, we believe, also for our city, Palm Coast. The campaign was launched in 2015. Since we’re stewards to a company-culture which holds trendsetters in high regard, it was impossible not to see it as tragic that Chisholm’s name could be lost on younger ears. As it happens, the topic is hot right now. Our first black president is still in office and our first woman was nominated to run for the same office on a major party ticket. Our digital team produced the Shirley Chisholm website and the #IKnowNow hashtag. Our efforts attracted the attention of national and international media outlets, and this BBC story titled Before Hillary Clinton, there was Shirley Chisholm, published on January 26, 2016 was an exciting validation of this passion project in 2016. We were humbled and honored to have been the subject of a cover story for the Flagler Chamber of Commerce’s quarterly publication, Thrive Magazine. The magazine offered every subscriber (all businesses in Palm Coast and Flagler County), an outlet to dive into the full range of Office Divvy’s services, the diffuse nature of which isn’t easy to squeeze into a traditional elevator pitch. The article also touched on the heightened level of data analysis we’re able to bring to our members regarding their own businesses. That type of insight breeds real growth strategy as it offers a look into business strategy and also how the competition is faring. In the past, and for many small businesses still, aggregating and analyzing data is a real burden. But we take the initiative to collate all of it and place it into a digital dashboard. A cooperative, collaborative community for interesting people doing interesting things. We were as shocked when one of our longest standing members, Jonathan Stanley, owner of PC Specialists, died suddenly and unexpectedly this past May. Jonathan was a proficient IT man, a successful entrepreneur, and an all around nice man. He was also an effective communicator when it came to explaining how to better navigate computers for the layman. Because of that, when he taught the occasional Office Divvy class on related matters, how to use Windows 10 for example, people always walked away knowing better able to appreciate all that was available to them on their PC. That’s why we kept having him come back to teach more of them. Jonathan, if you’re reading this from up there, know this: You will always be remembered! Our inaugural contest, Most Interesting Startup in Flagler County was huge! This contest, as the title suggests, sought out the most interesting local Startups–those three years old and younger. We received a very solid 30 entries our first year out. Our winner, Snappy Kraken, was awarded approximately $46,000 worth of cash and Office Divvy services. So one of our dreams has been to pretty much democratize amazing agency-level marketing and give that to small business owners. They’ve done this by setting up a system that automates hundreds of thousands of dollars worth of professional marketing material, accessed through a subscription model. Learn more about our winner, here: We have a Winner! Most Interesting Startup in Flagler County (2016). The storm was doozy and left a trail of destruction in its path across the Caribbean before it touched down on our coast. 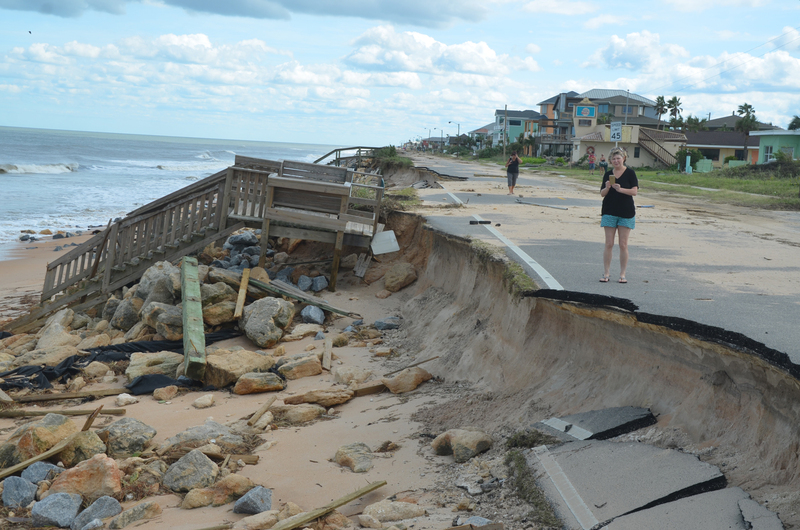 As you can guess, after landing here, it did a number to our beach and State Road A1A. The following week, our call volume spiked, particularly for members with trucks in the field, such as roofers and gutter-and-screen installers. So, while the storm was a financial setback for many, for others it was a boon. Such is life.For us, that required making some adjustments and reallocating resources, in this case employees. All hands were on deck: In addition to our core Call Desk team, we pulled in additional team members from other departments to help out with calls. For instance, we even had to throw our content writer on the phones, which were ringing off the hook. Fortunately, he had months of past experience on our phones, otherwise we wouldn’t have been able to do that. The work is too important. But you see, we’re were in position to be guerrilla-like in how we handle these types of situations. Each year, the Daytona Beach News-Journal and Flagler/Palm Coast News-Tribune organizes a contest, the Reader’s Choice or Best Around Awards depending on which county it’s running in. It’s powered by the votes of the readers. In 2016, Office Divvy walked away with two “Best Around” awards. COWORK by Office Divvy took home the Best Event Space award and Office Divvy won Best Customer Service. In addition, 12 of our clients also were also the recipient of Reader’s Choice awards in 2016. Organizing nine well-attended Entrepreneur Nights every year is just business as usual for Office Divvy. But this grassroots event for entrepreneurs and by entrepreneurs, started back in 2011, celebrated its 5th Anniversary this year! Another high point was that the Entrepreneur Night event went to Daytona Beach for the first time in 2016. With that, this event has been held in 3 Counties and 6 Cities so far! By the way, check out the November 2016 Entrepreneur Night recap to read about all the high, low points of the year for various local entrepreneurs. Record: 131 Office Divvy Events! Certainly Entrepreneur Night is one of the Office Divvy events we’re most proud of. But we offer many other events, classes, workshops, clinics, meetings. 2016 was a record year in that we had 131 events in total, including the Entrepreneur Night events! 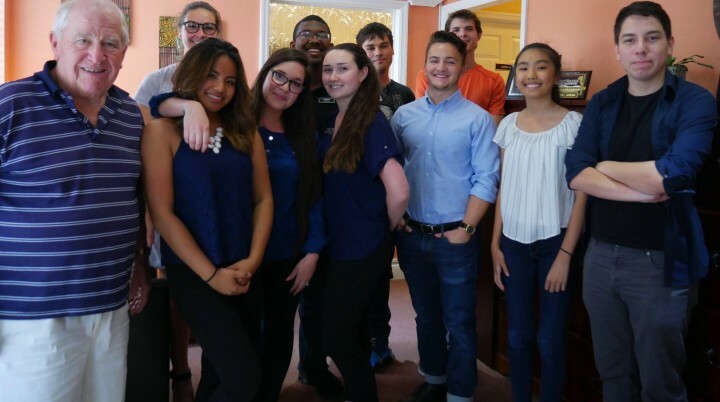 Our Digital Team of high school interns and junior associates (comprised of College students) completed over a dozen digital projects. That work included websites for friends. We’re most proud of their terrific work in redesigning the website for Flagler Cats, one of our favorite non-profits. Office Divvy Co-founders Ky and Lisa Ekinci came to know Flagler Cats founder Mari Molina when they were still relatively new to the county. After running into Molina at numerous business community functions, it didn’t take long to see what a community oriented person Molina was. They’ve been working together ever since. The digital work we’ve done there has already measurably helped the organization raise funds to continue their humane Trap, Spay, and Neuter method of dealing with the county’s feral cat populations. We formed a collaborative partnership with the Flagler County Education Foundation to launch a premiere Internship pilot-program. We’re setting out to give high school students the soft skills and competency they’ll need to separate themselves from their peers when they enter or even apply for their first internship. First, they’ll learn how to have positive and impressionable interactions with senior members of a team. That’ll get them in the door. Then, once there, there’ll be no helplessness: They’ll learn how they can be useful even after they’ve finished their assigned task–when there’s no one available to show them what to do next. They’ll also understand not only the importance of collaborative tools/task management systems but also to be functional with them. One of our previous high school interns, Kedron Abbott, who later became a Junior Associate, and who is now in College in Alabama, came back to work with us to implement the project plan in the last two weeks of 2016. This program will be rolled out in April for county-wide internships for high school students. This is an awesome opportunity for high school students in Flagler County and we are super excited to be a part of it. Among our Office Divvy members, we’ve had a few new parents this year: Dr. Paint’s Omar and Katherine Rivera. Other members are kin to someone who’s recently given birth: Killian’s House of Screens and Seamless Gutters’ Hans and Rosemarie Killian. We’ve also now have a couple of partners/members who’re now expecting: CPA Jonathan Covery and his wife and Pool Captain’s Adam and Rachel Beaty. What better way to end this recap, as we almost always do, with some numbers before some closing words. Come January 2nd, Office Divvy will be 9 years in business! This is what we’ve accomplished across that span. All of those figures did not come easily or over night. Obviously, much of that took years. The point is, each year, we spend a lot of time taking steps and making investments (both in projects and people) for the future, understanding they may not bear fruit for some time, if it all. So sometimes time passes and it may appear on the outside that we don’t have much to show for it. But that’s not true. In the New Year, we will continue trucking along, implementing much of what we’ve already begun, but planting new seeds as well. With all that said, here’s to a “Helluva’ a Year” in 2017…Just like this past one!